Beloved within the Nashville community, Charlie Worsham continues to receive widespread attention for his new album, ‘Beginning of Things’. NPR Music praises the way his music exhibits “deep musicality…great playing, [and] sophisticated lyricism…” with Rolling Stone naming the album to their 40 Best Country and Americana Albums of 2017 calling it “The Most Vulnerable Country Album” of the year. Variety, CMT, and PopMatters are just a few of the esteemed outlets who included his sophomore effort on year-end best of lists. Born and raised in Mississippi, Worsham attended Grenada High School and went on to study at Boston’s prestigious Berklee College of Music. In addition to his life as a musician, Worsham is actively involved in music education and, last year, founded the Follow Your Heart Scholarship Fund in partnership with The Community Foundation of Middle Tennessee. The fund supports the youth of Grenada, Mississippi—his hometown—who possess uncommon talent and desire to achieve great things in the arts. In its first year, the organisation has raised nearly $50,000. 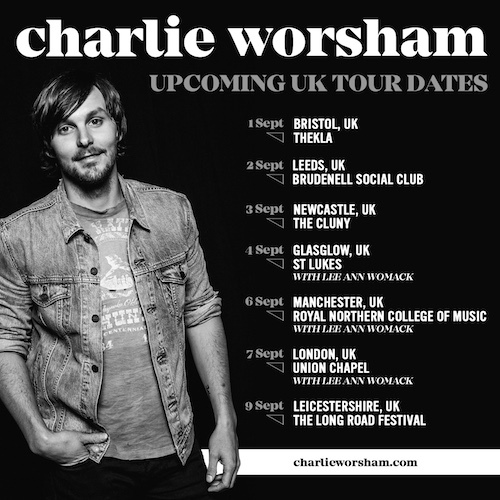 More information can be found at http://www.FollowYourHeartArts.org and http://www.charlieworsham.com. Follow him on Facebook at facebook.com/thecharlieworsham and on Twitter @charlieworsham.